WORCESTER — Susan Stoops is one of the smartest curators in America. Every time you go to the Worcester Art Museum, where Stoops has been in charge of contemporary art since 1999, you see the single large gallery reserved for contemporary projects given over to a solo or group show so elegantly conceived, and so surprising, that you assume she must be backed by a talented team with unlimited resources. She isn’t, of course. Stoops has been at the museum during a period when money has been scarce and leadership in transition. But time and again, she has put her hands in the loamy earth and pulled out wonders. Her shows, most of which draw on the museum’s permanent collection, remind us what curators can achieve with a bit of imagination and intelligence. Not incidentally, they — and WAM’s impressive galleries for postwar international art from the permanent collection — reveal Worcester’s contemporary collection as very rich terrain. “You Are Here,” a group show of 13 international artists, eight of them women, is one of Stoops’s best efforts. It’s one of those theme-based group shows that sounds woolly and slightly soporific in description — “reimagining the body and its boundaries,” “locating the body through spaces, materials, sensations, and information that exist in relation to it (and to us)” — but that is actually captivating, because it trusts the works themselves to set the brain fizzing. And they do. The exhibition contains sculptures, photographs, paintings, and prints that hang on the wall, sit on the floor, or are suspended from the ceiling. Without any kind of extra pleading or fake explaining, these various works, elegantly spaced out, trigger thoughts and sensations that relate to childhood, memory, and physical scale, and resound with one another. Each work relates to the body, operating as a kind of substitute or synecdoche, the way metonyms do in poetry (a “hired hand,” for instance, instead of a “worker”). But because we are dealing with things, not words, there is a strange and unpredictable interplay between poetic allusion and actual, physical object. So, for instance, Charles LeDray’s miniature sailor’s uniform, hanging from a pink coat hanger, might look like clothing for a child’s doll. But here it is, hanging on the wall at adult height — and it evokes adult confusions: Who and what is this uniform, or any uniform, for? Why the pink hanger? Nearby, in a lovely inversion of scale, is a vastly oversize shirt with vertical slashes by Amanda Ross-Ho, a Los Angeles-based conceptual artist. One sign of Stoops’s talent — not unlike that of a good dinner-party host — is her ability to make less-than-riveting work seem more interesting by putting it in the right company. Gillian Wearing, a brilliant artist from Britain who is absorbed in the dynamics of constraint and liberation made possible by masks, performs another surprising shift in scale. 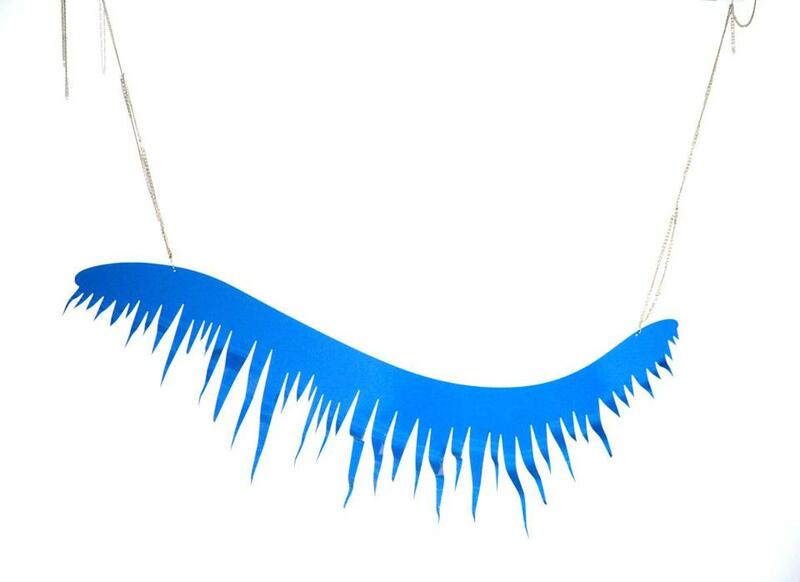 She has created an oversize necklace that, instead of a pendant or jewel, has a life-size mask of her own face. It’s a brilliant conceit that sets off a domino-run of associations: the idea of one’s “self” as one’s own adornment; one’s own death mask suspended in front of one’s heart; ornament as camouflage, and perhaps even as crime (a mask helps you get away with things) . . .
Inversions and ironies are a leitmotif throughout the show. Several works substitute abstract imagery for specific people. The effect, on the one hand, is to draw attention to the limited nature of conventional likenesses, and on the other, to transform abstraction into exactly what it is not: a humanly specific representation. Inigo Manglano-Ovalle, for instance, has three large colored prints representing filtered DNA components of three members of the family of Byron Kim. Visually unimpressive, the works nonetheless suggest that, for better or for worse, the usually hidden features of a person’s DNA might identify a person more surely than the color of his or her eyes, or the way they are placed in relation to his nose. Kim, a fellow artist and friend of Manglano-Ovalle, has an abstracted portrait of his own on display: It’s a vertically oriented painting representing his son Emmett (whose DNA is pictured in one of Manglano-Ovalle’s prints). Kim’s painting is exactly the height of his (then 10-year-old) son, but Emmett’s features have been converted into horizontal bands of color. All these unexpected inversions and shifts in scale suggest the Looking Glass world of Lewis Carroll’s Alice. And so it’s perhaps no surprise that most of the work in “You Are Here” suggests that you are not in fact here but somewhere else — very possibly back in your own childhood. Annette Lemieux, for instance, has given minimalism one of her characteristically personal twists by re-creating a section of the roof of her childhood home. Its size is commensurate with her own (adult) body, arms extended. Milagros de la Torre, meanwhile, has three photographs from her 1996 series “The Lost Steps.” Small and beautiful black-and-white shots of objects that emerge slowly from a netherworld of grays, these photographs actually show disturbing evidence collected by police: a crowbar used to force entry, a skirt worn by a pregnant woman who was thrown by her lover from the eighth floor of a hotel, and a handgun used in murder. There is a current of unease that runs through the whole show, and surges into the open in Rona Pondick’s “Treats,” a cluster of pink and white balls resembling teeth and gums. But other works here suggest childhood in less overtly disturbing ways. 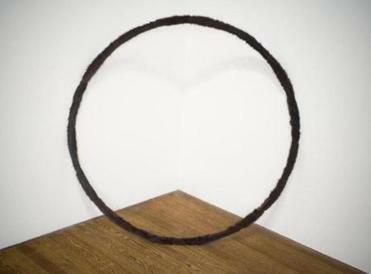 Claire Barclay’s hoop covered in fur suggests playground entertainments. Tory Fair’s mirror made from resin suggests not so much a young girl’s infatuation with her own image as an imaginative portal to elsewhere. And Gary Schneider’s photogram of his own hand suggests both early cave painting (the “childhood of man”) and kids’ finger painting. It is, as I said, a very impressive show, one that’s willing to pour cool water on the simmering self-absorption and spitting sensationalism of the contemporary art world. It’s a show worth seeing.